NEW DELHI — For years, this sprawling city on the Yamuna River had the dirtiest air in the world, but few who lived here seemed conscious of the problem or worried about its consequences. Now, suddenly, that has begun to change. Some among New Delhi’s Indian and foreign elites have started to wear the white surgical masks so common in Beijing. The United States Embassy purchased 1,800 high-end air purifiers in recent months for staff members’ homes, with many other major embassies following suit. For the rest of the NY Times story click here. Wow!! First Beijing, now India. Just want to let you know that we also ship our air purifiers, air cleaners, air filtration systems to other overseas countries other than USA and Canada. Our air filtration systems also come in 220 – 240 Volts power configuration. We offer a wide range of air filtration systems, air purifiers, air cleaners to help reduce your exposure to hazardous, unhealthy, polluted air. 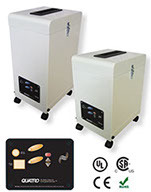 Many of our air filtration systems are configured to help reduce / remove airborne particles, yes down to .3 microns using medical grade HEPA filter, reduce your exposure to harmful chemical fumes, chemical gases, odors using activated carbon / activated charcoal filtration, and for that extra level of protection and disinfection, an optional UV (Ultra-Violet) Bulb stage. Contact us for help with choosing the right air filtration system for your needs and application. This entry was posted in Asthma, Ceiling, Wall Mount Air Filtration, Air Cleaner, Air Purifier, Chemical Fumes Gases, Daycare Center, Home for Elderly, Seniors Residence Odor Problem, Home, Office Air Filtration, Air Purifier, Air Cleaner, Hospitals Healthcare Medical Air Filtration, Multiple Purpose Air Filtration System, Smog air pollution, UV Light Upgrade Option Air Filtration System and tagged 220 Volts, 240 Volts, activated carbon, air cleaner, Air Cleaners, air filtration, air filtration systems, Air pollution, air purifier, Air Purifiers, asthma, auto exhaust, Beijing, breathing problems, chemical filter, chemical gas, China, fumes, hepa filter, India, lungs, portable, smog, surgical masks, UV Light. Bookmark the permalink.